Do you love your video games as much as my kids love theirs? If the answer is yes than this product is for you. Up for review today is the Memorex Racing Wheel Family Pack made for the Wii. I know, I know. You are asking, "What makes these different than the cheap racing wheels I can buy?" The answer is simply, "A lot!" The first and most obvious difference is the appearance. These wheels are mostly black but each one has a different color of non slip grip pads on them. The accent colors are red, blue and black. Each wheel actually opens up along the side so the Wii remote can fit in snugly. It then closes back up to ensure a secure connection and fit. There is no way this remote is going anywhere! Build quality was surprisingly good, and put together well. It did not feel like flimsy plastic, and had some mass to it. I was expecting more of a cheap plastic that felt easy to break. That's not what the Memorex Racing Wheel Family Pack turned up to be. And getting 3 of them in different colors was also nice. Using the Memorex Racing Wheel was also very comfortable to use. I didn't expect it to make much of a difference. But playing the game with the steering wheel actually did make the experience more real. And having the storage compartments for not just the controller, but for the MotionPlus as well proved to really help. 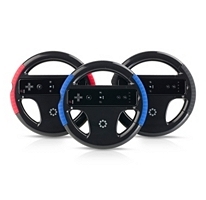 It made for a better looking Racing Wheel, and also kept the cables from getting in the way. In the end, I was surprised with the Memorex Racing Wheel Family Pack for the Wii. I was surprised with the build quality of the controller. It was put together very well. And the use of the controller was equally impressive. It actually did make a difference. For more information and complete specs, check out their website at http://www.memorex.com/.